One of the terms you hear a lot when dealing with containers is "container runtime". "Container runtime" can have different meanings to different people so it's no wonder that it's such a confusing and vaguely understood term, even within the container community. Part 1: Intro to Container Runtimes: why are they so confusing? This post will explain what container runtimes are and why there is so much confusion. I will then dive into different types of container runtimes, what they do, and how they are different from each other. Traditionally, a computer programmer might know "runtime" as either the lifecycle phase when a program is running, or the specific implementation of a language that supports its execution. An example might be the Java HotSpot runtime. This latter meaning is the closest to "container runtime". A container runtime is responsible for all the parts of running a container that isn't actually running the program itself. As we will see throughout this series, runtimes implement varying levels of features, but running a container is actually all that's required to call something a container runtime. Why are Container Runtimes so Confusing? At the time, Docker was a monolithic system. However, none of these features were really dependent on each other. Each of these could be implemented in smaller and more focused tools that could be used together. Each of the tools could work together by using a common format, a container standard. Because of that, Docker, Google, CoreOS, and other vendors created the Open Container Initiative (OCI). They then broke out their code for running containers as a tool and library called runc and donated it to OCI as a reference implementation of the OCI runtime specification. Unpack the image into a "bundle". This flattens the layers into a single filesystem. What Docker standardized was only #3. Until that was clarified, everyone had thought of a container runtime as supporting all of the features Docker supported. Eventually, Docker folks clarified that the original spec stated that only the "running the container" part that made up the runtime. This is a disconnect that continues even today, and makes "container runtimes" such a confusing topic. I'll hopefully show that neither side is totally wrong and I'll use the term pretty broadly in this blog post. When folks think of container runtimes, a list of examples might come to mind; runc, lxc, lmctfy, Docker (containerd), rkt, cri-o. Each of these is built for different situations and implements different features. Some, like containerd and cri-o, actually use runc to run the container but implement image management and APIs on top. You can think of these features -- which include image transport, image management, image unpacking, and APIs -- as high-level features as compared to runc's low-level implementation. 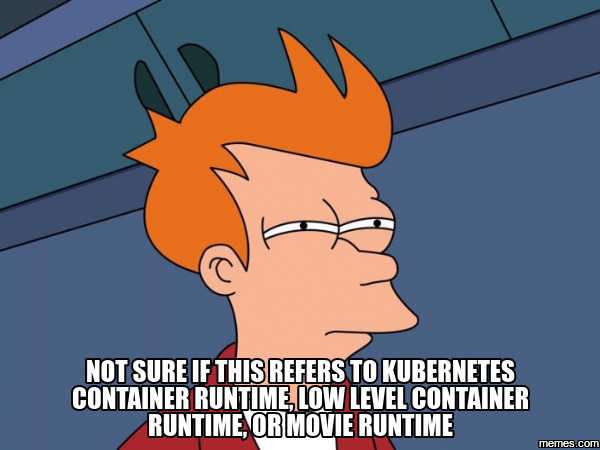 So for practical purposes, actual container runtimes that focus on just running containers are usually referred to as "low-level container runtimes". Runtimes that support more high-level features, like image management and gRPC/Web APIs, are usually referred to as "high-level container tools", "high-level container runtimes" or usually just "container runtimes". I'll refer to them as "high-level container runtimes". It's important to note that low-level runtimes and high-level runtimes are fundamentally different things that solve different problems. Containers are implemented using Linux namespaces and cgroups. Namespaces let you virtualize system resources, like the file system or networking, for each container. Cgroups provide a way to limit the amount of resources like CPU and memory that each container can use. At the lowest level, container runtimes are responsible for setting up these namespaces and cgroups for containers, and then running commands inside those namespaces and cgroups. Low-level runtimes support using these operating system features. Typically, developers who want to run apps in containers will need more than just the features that low-level runtimes provide. They need APIs and features around image formats, image management, and sharing images. These features are provided by high-level runtimes. Low-level runtimes just don't provide enough features for this everyday use. For that reason the only folks that will actually use low-level runtimes would be developers who implement higher level runtimes, and tools for containers. Developers who implement low-level runtimes will say that higher level runtimes like containerd and cri-o are not actually container runtimes, as from their perspective they outsource the implementation of running a container to runc. But, from the user's perspective, they are a singular component that provides the ability to run containers. One implementation can be swapped out for another, so it still makes sense to call it a runtime from that perspective. Even though containerd and cri-o both use runc, they are very different projects that have very different feature support. I hope that helped explain container runtimes and why they are so hard to understand. Feel free to leave me comments below or on Twitter and let me know what about container runtimes was hardest for you to understand. In the next post I'll do a deep dive into low-level container runtimes. In that post I'll talk about exactly what low-level container runtimes do. I'll talk about popular low-level runtimes like runc and rkt, as well as unpopular-but-important ones like lmctfy. I'll even walk through how to implement a simple low-level runtime. Be sure to add my RSS feed or follow me on Twitter to get notified when the next blog post comes out. Thanks to Sandeep Dinesh, Mark Mandel, Craig Box, Maya Kaczorowski, and Joe Burnett for reviewing drafts of this post.